An ESA-provided photo showing the very raw image of the comet taken by Rosetta from a distance of approximately 12,000km. A SPACE PROBE aiming to become the first to land on a comet has taken images that appear to show its target could actually be two separate lumps of rock and ice, scientists said today. The pictures released by the European Space Agency were taken by its Rosetta probe, which is nearing the final stage of its decade-long mission to drop a lander on comet 67P/Churyumov-Gerasimenko. “It’s certainly an exciting surprise,” said Taylor. 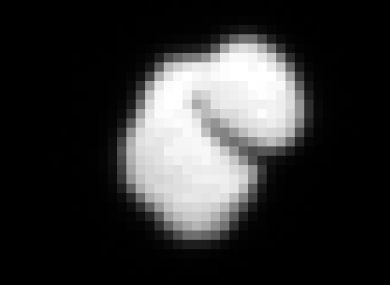 Until now 67P was believed to have a more compact, rounded form. One explanation is that the comet is a so-called contact binary composed of two parts, indicating that 67P either broke apart or fused with another comet at some point. Another is that it’s one unit deformed by its passage past Jupiter or the sun, said Taylor. Because the pictures were shot when Rosetta was 12,000km (7,457 miles) from the comet — about the distance between New York and Johannesburg — the unusual shape could also result from a digital processing method that was used to smoothen the image, he cautioned. “We’re looking forward to the next month when this body comes into closer resolution,” Taylor said, adding that for the time being scientists aren’t making any changes to the probe’s flight path. Rosetta is scheduled to come within 100km (62 miles) of the comet on 6 August. It will observe the comet for several months before attempting to drop a lander onto its icy surface in November. 67P is about 4km (2.5 miles) long and orbits the Sun every six-and-a-half years. Email “Comet-chasing probe sends back pics of 'strange-looking potato' formation”. Feedback on “Comet-chasing probe sends back pics of 'strange-looking potato' formation”.